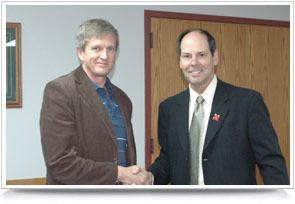 Dr. Hendrik Viljoen receiving the Willa Cather Professor of Chemical & Biomolecular Engineering from Dr. David Allen. Faculty Research and Creative Activity Award: Yong-Rak Kim, assistant professor, civil engineering; Won Mee Jang, associate professor, computer and electronics engineering; and Laurence Rilett, professor, civil engineering. Gary Krause, civil engineering, received the University of Nebraska at Omaha Alumni Association College of Engineering Faculty Teaching Award at the UNO Honors Faculty Convocation April 12.